On one hand, we had a poor fantasy PL futból scoring week. On the other hand, we could have transferred in Richarlison and suffered with the rest of you knee jerkers. Consistent double digit returns from captaining Mo Salah. Remember people, it’s a marathon, not a sprint. Salah has scored or assisted in all three matches so far, and we’d be hard pressed to take the captain label off him unless we see a matchup too tantalizing to resist for one of our other players. Swapped out Ben Davies (DEF – TOT) for Benjamin Mendy (DEF – MC). While Mendy did not get a clean sheet this week, this swap was a net gain of three points. In fact, Davies didn’t even start this past week against Manchester United, making way for Danny Rose. If Tottenham is going to rotate their fullbacks like this, even when Rose has been rusty for quite some time, then it’ll be awhile before we transfer Tottenham defenders back in. Swapped out Josh King (FWD – BOU) for Danny Ings (FWD – SOU). This caused us a net loss of seven points since King scored a goal off a penalty kick. What’s more upsetting than the loss of points is the transfer itself. 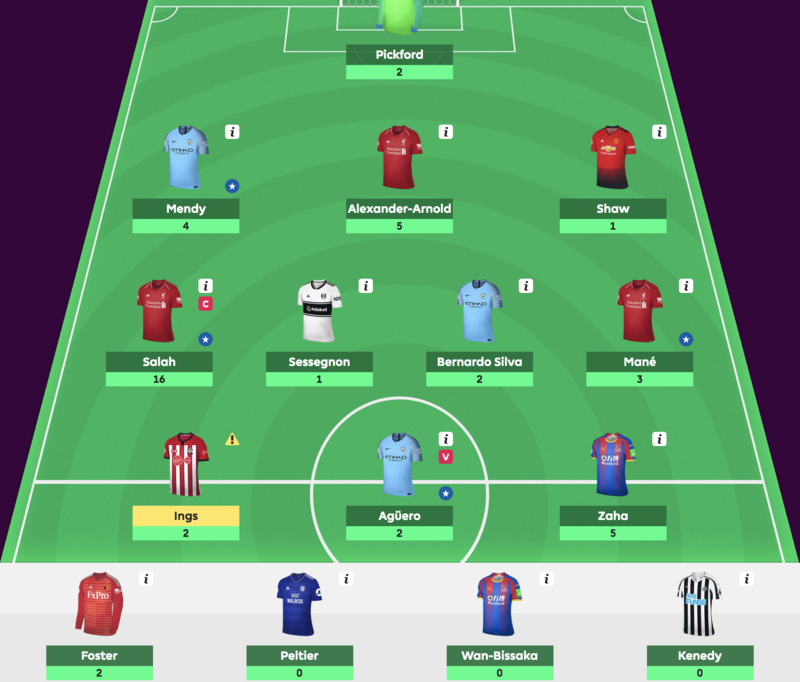 For example, we were looking to swap out one of our lower performing MIDs because all three of our bench players were projected to miss their match this past week. However, we didn’t expect Sessegnon (MID – FUL) to be benched. Continued starting of Jordan Pickford (EVE) as our goalie. He hasn’t returned one clean sheet at all this year despite the easy fixtures. While we can’t place the blame squarely on Pickford since his defense in front of him is trash, we can’t envision keeping Pickford for much longer. Who will we transfer in for the EPL matches in Game Week 4? Also, next week, the fantasy football season starts! Check out our post on how we did in our draft. 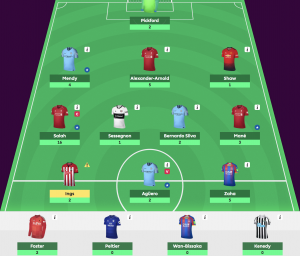 This entry was posted in Company News, StakeHaul Challenges and tagged English Premier League, EPL, fantasy futból, fantasy soccer, Premier League. Bookmark the permalink.